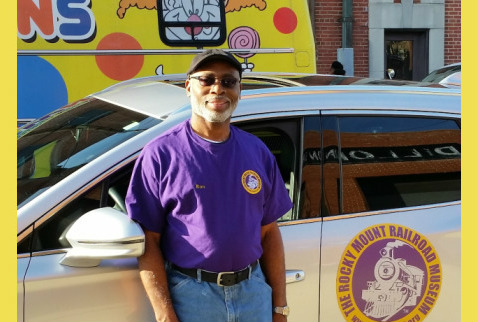 The Rocky Mount Railroad Museum participated in the 2015 Rocky Mount Christmas Parade this year. We were very pleased to display the museum's new logo on a magnetized disk that attaches to any vehicle. Ron Hines stands beside his vehicle with the logo attached. The new logo is also displayed on the museum's denim shirts, tee shirts, and polo shirts such as Ron is wearing. Anyone may order a shirt by contacting Joyce Edwards Dantzler at 252-314-7811. Children's tee shirts are also available.